Creating the Black Utopia of Buxton, Iowa---Coming January 28, 2019! New Buxton Book Just Released! Available now at Amazon, Arcadia Publishing, Barnes & Noble and more! 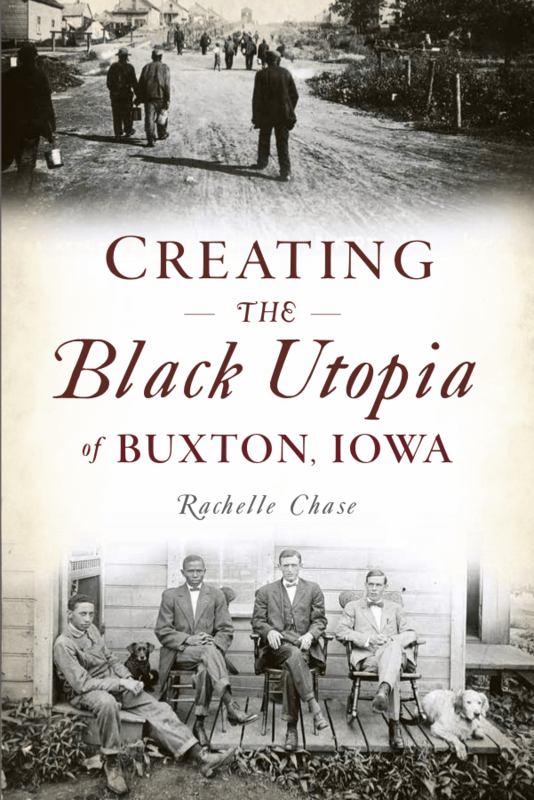 I’m excited to announce CREATING THE BLACK UTOPIA OF BUXTON, IOWA—published by The History Press—was released January 28, 2019. While LOST BUXTON, my 2017 release published by Arcadia Publishing, was a pictorial history of Buxton told primarily in the words of former residents and newspaper articles, CREATING THE BLACK UTOPIA OF BUXTON, IOWA provides much more detail about the town. Why another book about Buxton, you ask? Because after writing LOST BUXTON, there was so much more I wanted to know. The more I researched the accomplishments and treatment of African Americans in Buxton during the early 1900s compared to rest of the country, the more awestruck I was. The Introduction to CREATING THE BLACK UTOPIA OF BUXTON, IOWA, summarizes the reason for my sense of awe. Once upon a time, in a state that was 99.3 percent white and “foreign born” was the town of Buxton, Iowa—a town of 5,000 where 55 percent of the population was black. While African Americans throughout the country lived in segregated neighborhoods, in Buxton, they lived in one-and-a-half-story, five- to six-room houses identical to and next door to their white neighbors. While elsewhere African Americans weren’t allowed to shop in stores or dine in restaurants with white people, in Buxton, they shopped at and were clerks in the company store serving black and white customers. While black men could be lynched for simply being accused of talking to a white woman, in Buxton, a black doctor delivered white babies and a black dentist treated a white woman. While in other towns, black men couldn’t even enter a white YMCA, in Buxton, black men managed a $20,000 YMCA that was used by all races. While at other places, African American miners worked in separate mines at lower wages, in Buxton, they worked in the same mines and received equal pay. While in other places, black children went to separate schools, in Buxton, black and white children were in the same classrooms taught by black and white teachers. While in other places, blacks were hired for menial jobs, in Buxton, they worked in the company businesses doing many of the same jobs as whites, as well as owning restaurants, hotels, bakeries and other businesses that catered to both races. In a time of Jim Crow, extreme racism and violence against African Americans, Buxton, Iowa, seems like a fantasy. But what makes the fantasy even more fantastic is that Buxton was created by a corporation. Not just any corporation, but a corporation dealing in two industries—coal mining and the railroad—known for racism and unequal treatment of blacks. This is not a fantasy. This is the true story of Buxton, Iowa—the making of a black utopia. 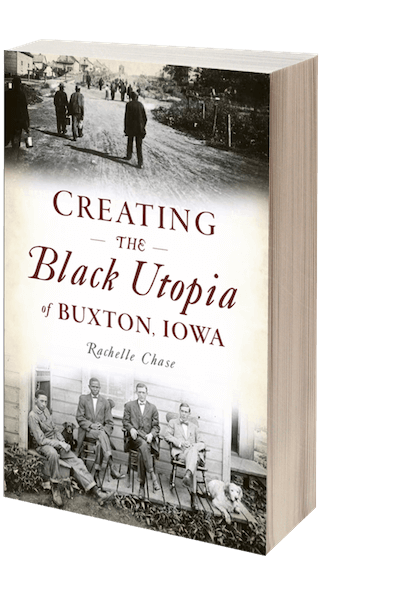 Introduction excerpted from CREATING THE BLACK UTOPIA OF BUXTON, IOWA by Rachelle Chase. Who were the men behind the creation of the town? How and why did “a corporation dealing in two industries—coal mining and the railroad—known for racism and unequal treatment of blacks” establish such a progressive town? What was the Chicago & North Western Railroad’s involvement in the town? How and why were African Americans the majority for most of Buxton’s existence? These were just a few of the questions I wanted to answer. Thus, CREATING THE BLACK UTOPIA OF BUXTON, IOWA was born. In it, I explore those questions and more. I can’t wait for you to read it! 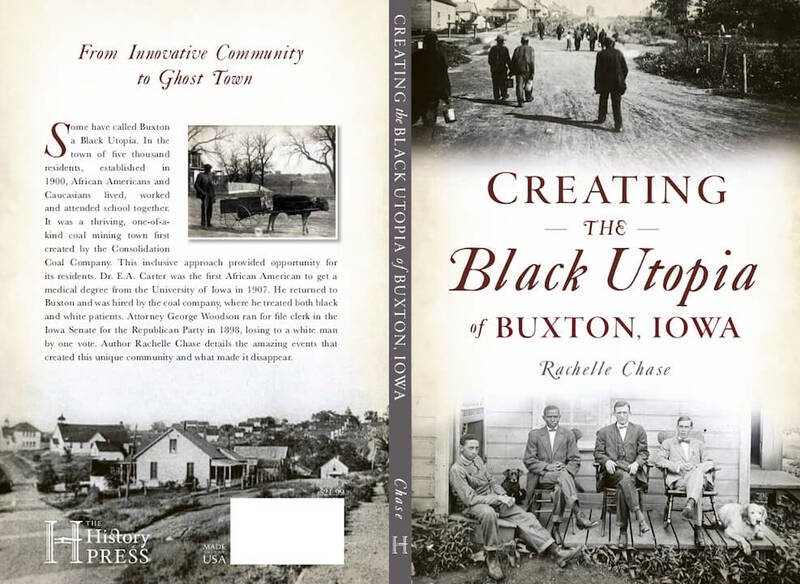 Draft of CREATING THE BLACK UTOPIA OF BUXTON, IOWA book cover. May I ask how much for your book? I’m very excited to read it. Hi Thomas. Thanks so much for your interest! The book will be $21.99. I see you signed up for my newsletter (thank you!) so I will definitely notify you when it comes out. Just curious: Had you heard of Buxton before this? I live in Monroe County, Iowa. It was a Great Utopia ahead of time! My grandpa born there in 1901! His dad a black miner from Virginia. Neat, Linda. Did he share any stories? Interesting, I understand my family moved to Des Moines from Buxton. I’m a Clayborne…any history involving my family namesake, (Clayborne, Clayburne, Clayborne). Just curious. I didn’t get a notification regarding your reply so I’m sorry for the delay. I have come across Clayborne, but it was the first name. I don’t remember any with the last name of Clayborne but I will let you know if I do. Thanks for stopping by, Keith. Wow….I am from Waterloo, Iowa and NEVER heard of this before. Where can I get a copy? Thank you Rachel! Buxton is, indeed, an amazing part of history. There are links at the top of the page taking you to online retailers. I am awaiting a list from my publisher as to local retailers. The following are some that I know have it: Book Vault in Oskaloosa, Barnes & Noble in West Des Moines, RAYGUN in Des Moines (will have it on Friday). I will also be adding autographed copies to this site the first weekend in March (had hoped to have them available sooner but …). I just checked out your web site. Your introduction to your presentation, “I am not Seal” made me laugh. I look forward to learning more about your work as a Social Futurist. My name is Will Smith l am from Waterloo, lowa l learn of Buxton from my Ex-Wife because her family and relatives had ties to Buxton. 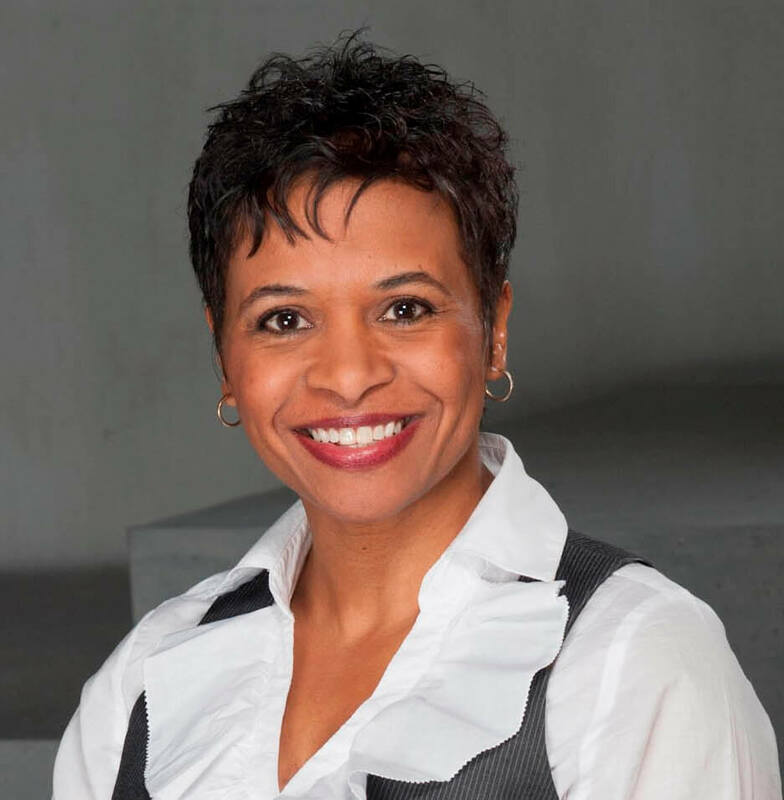 My Ex-wife is a Harrington and Willie Mae Wright who’s well known here in Waterloo. I would ask the writer of this book to consider visit some of the membes here in Waterloo. I would be very interested in visiting Waterloo, as I have heard others mention that former Buxton residents moved there after Buxton was shut down. I just Googled Willie Mae Wright — what an admirable woman! I ran across some Wrights while researching Buxton but, at the moment, can’t remember the names. If I can find any connection to Ms. Willie Mae, I will let you know. Dear Rachelle, Congratulations on the new book! Being an out-of-stater, was Buxton part of Marshalltown? I hope to add my long-ago uncle, the Rev. James Lytle, to Iowa’s Freedom Trail Project. He grew up “free-colored” in North Carolina, became a Wesleyan Methodist minister and active in the underground railroad in Indiana, and spent 1863-1865 ministering in Amity as freedom seekers from slave-state Missouri streamed through. He died in 1904 near Riverton, Fremont Co. Thank you for the congratulations! No, Buxton was established by the Consolidation Coal Company in 1900 so there is no connection with the Underground Railroad. It’s about 77 miles south of Marshalltown. Though I started researching Buxton in 2008, I have only lived in Iowa for 5 years so I am still discovering its history. I have not been to the places you mentioned but I will add them to my list. They sound quite interesting. Wow. Your long-ago uncle sounds fascinating! Did it take you a long time to research his story? He sounds like a great addition to the Iowa’s Freedom Trail Project! Do you have photos or any memorabilia of him? On the Underground Railroad. FYI. I have visited the Library and had heard that West Branch was a stop on the Underground Railroad. Are there any buildings in town that were a known stop? Thank you for your interest in Buxton! My book provides a beginning-to-end take on Buxton and the men and company (Chicago & North Western Railroad) behind it. I will begin posting weekly articles about Buxton on this site as well. “Buxton: A Black Utopia in the Heartland” is also another good resource. I have spent most my childhood in a nearby small town, Bussey. Now at 46 years old I recently purchased a home near the area of Buxton. Very interested and residing just a few miles from the area I have viewed some evidence of the railroad and foundations of homes on walks and atv rides. Thank you for researching and writing your books! I am excited to receive them soon and begin reading! That is neat that you are so close to Buxton — and have discovered structural ruins from the past. Oh, the stories they could tell! Thank you for your interest and I hope you enjoy my book(s)! Looking forward to this coming out! That makes me happy, Robert. 🙂 I hope you enjoy it! Will they be autographed? I have an Ottumwa autographed authors collection! Suzy, the ones sold online will not be autographed. But if you are in Ottumwa, I would be happy to get you an autographed copy or sign yours if you get one before I see you. Soon, I hope to sell them on this site — those will be autographed — but that is a few weeks away. I will announce it and share the news in my newsletter when I’ve added it. Thanks for asking! Rachelle , I am very interested in the new book. I was born in Albia Ia now live in Knoxville I have been to Buxton a few times to explore the still standing buildings . Will love to know more about the history of this town . Hi Bob, That’s great that you had a chance to visit the site. Were you able to visit the cemetery as well? Thanks for your interest in my book — and Buxton! It is definitely a one-of-a-kind town. Would be interested in your book. Please let me know when it’s available. My grandmother lived there at sometime in her life. I grew up in Albia and i remember we drove by Buxton one day. Had no idea that there is a way to get in there and look around. Would have enjoyed seeing it. I look forward to being able to read more about Buxton. Thanks so much for your interest! If you have signed up for my newsletter, you will be notified when it is available. I will also post it here and on Facebook. I didn’t know you could go to the site, either, until a friend introduced me to the owner of the property in 2008 and we went by. Now, you can call the Monroe County Historical Society for details if you want to visit. Hope you get a chance to stop by. I’ve been fascinated with Buxton ever since I heard of it (with in the past 5 years or so). I would like information on how to order the book. Thanks for asking. Click the pre-order text at the top of this page to purchase it from Amazon and save 21% before 1/28. It is also available at the Arcadia Publishing site for pre-order here: https://www.arcadiapublishing.com/Products/9781467140461. By the end of the month, I will also post a list of the stores I know that carry it. I grew up in Dalton MO we are in the process of purchasing and reclaiming a high school which was commissioned in the image of Tuskegee Institute to educate young African American students regarding agriculture and support services. Been abandoned since integration. Dalton’s history smaller scale is similar to history Braxton. The property has been registered as a nation historic property. Thanks for sharing the information on Dalton. I hadn’t heard of the school but now I am intrigued. After I Googled it, I stumbled upon the following: https://www.thepitchkc.com/news/article/20613257/roots-revival. Wow. What history! That’s wonderful that it is being restored. I must make a note to see it when I am in MO next. I’d love to follow the progress and/or learn more — is there a Facebook page or web site devoted to the project? Will you be doing a reading at Prarie Lights in Iowa City? I hope to. I did a presentation there for “Lost Buxton” and hope to do something similar for this book. I will be adding events to this site soon and will add that event as well, if it is confirmed. Do sign up for my mailing list so you will for sure be notified. It is wonderful to see we’ll learn more about the remarkable history of Buxton. We sensed at the “Lost Buxton” public events that you were intrigued by what yet lay ahead in researching the lives of the people who transcended division and racism to build a prosperous community. Sure hope there are public events with “Creating the Black Utopia”….. including with your many friends here in Salem. How wonderful to hear from you! Yes, I just couldn’t stop researching. 😀 Thanks so much for the kind words. I am working on public events and would love to share my new findings with my friends in Salem. Buxton’s story is a truly remarkable part of America’s story; I’m grateful that you’re bringing it into the spotlight. I want to get an autographed copy and look forward to information on ordering it from you. Thanks for stopping by. I’m glad you think so, too! And thanks for the compliment. I hope to get the shopping cart working on my site this weekend or before the end of this coming week (if problems are encountered). So, you will be able to get an autographed copy here or at one of my upcoming presentations, if you are in Iowa. 3 yrs ago I bought a place close by…was told it was a stage coach stop back in the day. My house was built in 1900…very curious and want to learn more..
Wow. That would be great if you could find old photos of your property when it was a stage coach stop. Buxton was quite amazing. I am still curious and want to learn more, too. 🙂 Still so many unanswered questions. I haven’t come across that name in my research — of course, there are a bazillion names that I haven’t heard of, but I am sometimes pleasantly surprised when I encounter some familiar ones. This may be a silly question but I have to ask: Have you visited the Monroe County Historical Society in Albia? They might have information about stagecoaches in the area or may be able to refer you to a local who knows something. They’ve provided some excellent referrals for me. That’s great that you’ve visited to cemetery. They did such a wonderful job restoring it. My grandfather grew up in Buxton. His father (Walter Beardsley) was a miner and he always told stories of the Buxton Wonders, the town baseball team. He also taught us that people are people and color should not matter. He didn’t really know about prejudice until he moved to Des Moines after his father died (black lung from mining). Look forward to reading your book. Your grandfather’s comment is interesting as I’ve heard a lot of former residents say the same thing after leaving Buxton and moving elsewhere. That was the sad reality. The Buxton Wonders had quite the reputation for being great players — and of being clowns, kind of like the Harlem Globetrotters were in basketball. But former residents said they were so good, they could be, though they got serious when playing tough teams. Do you remember any of the stories? Hello, I’m so excited about the book and learning about Buxton Ia. I grew up in Waterloo. I love reading about the history of Iowa. I now live in Mississippi, Have did a lot of research on the Jim Crow era. The Mississippi Civil Rights Museum. The History Of Mississippi. I’m always lead back to Iowa. Your book is something new and different especially at that time period. Thank you! Thanks for stopping by — and for your interest in Buxton! I just Googled The Mississippi Civil Rights Museum. It looks like a great museum to visit. I have added it to my Must See list. Was your research for the museum? Have you heard of/been to the Jim Crow Museum of Racist Memorabilia in Grand Rapids, MI? Another Must See museum. I will be posting an article here about it in the next day or so. I’m an African American female born & raised in Iowa. My grandfather was born in Machikanek, Iowa and raised in Buxton. What is your connection, if any, to Buxton? Until now it’s always been a well-kept secret amongst people of color in Iowa. I’m curious to know you came about Buxton. I love learning about people who have connections to Buxton. Did your grandfather talk about his time in Muchakinock/Buxton? In 2008, while living in San Francisco, I visited a friend in Ottumwa who told me about Buxton and took me to what’s left of it. I couldn’t believe it existed and would continue researching every time I came back to visit, never knowing what I would do with the research. I just couldn’t get it out of my mind. When I moved to Iowa in 2014, I felt I had to write a book. 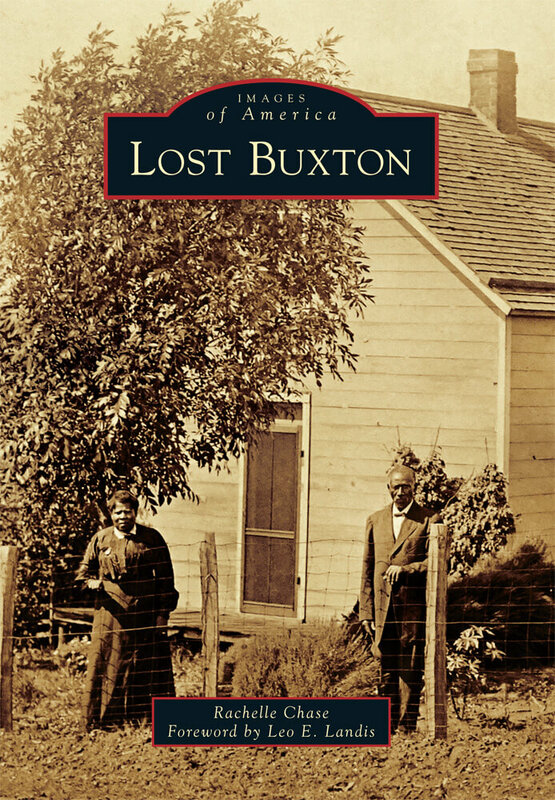 “Lost Buxton” was my first book, released in 2017. And now this one. I used to live in that area and have moved to Washington, Iowa, to open an art center. We are always looking to showcase local authors. Would you have any interest in chatting about the possibility of holding a reading and selling some of your books? Thank you for the invitation. Your arts center looks wonderful and I would love to speak there. Please send me a note via the contact form on my page and we can discuss the details. I look forward to chatting soon! I just read the article in the Des Moines Register regarding the Cory Booker connection to Buxton and saw that you have published two non-fiction books which I plan on purchasing. I have been researching the family history of the owners of our 1865 house in Adel. We discovered a treasure trove of letters (postmarked 1905) to one of the daughters. Several of the letters were on Oskaloosa and Buxton Electric Railway Company letterhead. Also in the letters was a newspaper article from the Oskaloosa Saturday Globe regarding Harry O’Neill who was the president of the Oskaloosa and Buxton Interurban Railway. I’m looking forward to reading your books to see if there is any information regarding Mr. O’Neill. I haven’t been successful on finding much information on him yet.